Our Italian adventure moved on from Bari, north to the Gargano peninsula, with breathtaking views of the Adriatic, like the one above. It is impossible to pick a favourite bit of the holiday, but this is the place I think back to the most when I am reminiscing and trying to calm my mind during a busy work week. It was a drive of a few hours and Tutt had a new SatNav with European maps, so it should have been quite straightforward. We didn't bother with the scenic route, going up the motorway and stopping only for drinks. We went into one of the sparsest petrol stations I've ever seen, where I bought a large bottle of water and ... oh yes, a delicious Italian coffee, perfectly made in the enormous, state-of-the-art coffee contraption behind the till. Bizarre. After a while the Gargano peninsula became obvious on the horizon. It forms the spur of the boot of Italy, but on a map you would never know that the whole thing appears, at least as you're driving towards it from the south, to be like a huge ridge of land, sticking up as well as out. It literally drops off at land end in what must be a hillside too steep to allow for a road. This is why there are so few beaches: the land drops right to the sea, in most cases. We finally found the hotel mid-afternoon, after the directions, the hotel address and the SatNav had all delivered us to the middle of Mattinatta, when the hotel is actually some way around the coast from there. 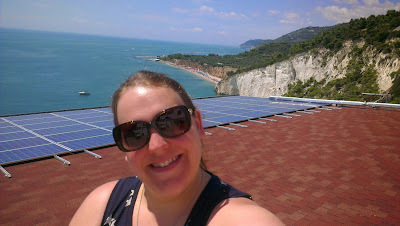 We spent two nights at the Villa Scapone, a very charming hotel that is nestled into the cliff. It was the one I had been looking forward to the most, I think: poring over the website and its Facebook pictures, most of which show that gorgeous Adriatic scenery. Glorious! The staff were very polite and helpful, particularly the maitre d', who joked that we had brought the English weather, since it rained when we arrived. We thought the hotel would be heaving but it was quite quiet - then, it was right at the end of July so maybe just before they got busy. It was a slightly battered luxury that looked like it had been given a hard time by the rain and seawater; a nice pool, a fitness suite which we looked at but didn't use, and 200 steps down to a dock with canoes for rent, to visit the nearby beaches. I am still sorry I didn't manage to get in a canoe to explore the coastline but when I went there was nobody there and Tutt wasn't into it, anyway. I think there was as much outdoor space as there was indoor space, and the views were perfect for fans of the colour blue. Thus, this was the hotel of relaxation. We lay on the sun loungers in the shade and read all our trashy magazines cover to cover. We napped. We visited the restaurant for dinner and finally got cracking on the Prosecco. I took selfies (Tutt disadins this sort of behaviour, though she just about manages to put up with it), and sometimes even helps. This was the fish antipasti. Octopus carpaccio, yum. I would definitely come back here. I felt very relaxed by the time we left and ready to get on with the sight-seeing.